Original Editors -Amanda Fetz & Katie Robertson from Bellarmine University's Pathophysiology of Complex Patient Problems project. Rheumatoid arthritis (RA) is an autoimmune disease and a form of inflammatory arthritis that affects five or more joints. Autoimmune conditions occur when the body fights its own immune system. Instead of the immune system protecting the body, it attacks itself. In RA, the immune system attacks the lining of the joints, called the synovium. RA is a long-term disease that leads to inflammation of the joints and surrounding tissues and can also affect other organs. These tissues include tendon sheaths, bursa, and tendons. Symptoms may present as inflammation of joints, pain and fatigue, morning stiffness, and hot and warm joints that may be red. Furthermore, if not treated, RA can possibly lead to joint deformities in the later stages of the disease which then function of the joints could be lost permanently. a. Monocyclic: Having one episode that does not reoccur. This usually ends within 2-5 years of initial diagnosis. b. Polycyclic: The disease severity varies over the course of the progression of the condition. c. Progressive: Condition continues to become more severe and non-remitting. The prevalence of Rheumatoid Arthritis is estimated between 1.5- 2.1 million US adults or 10 cases per every 1000 people. There are nearly three times as many women then men with the disease. RA is found all around the world, but does tend to be more prevalent in the Native American and white population. The risk of RA increases with age. RA most commonly begins in women between the ages of 30 and 60. It often occurs later in life for men, but can happen at any age. When RA affects the pediatric population, it is called Juvenile Idiopathic Arthritis (JIA) and usually begins before the age of 16. RA has many effects on individuals including mortality, hospitalization, work disability, increase in medical cost/expenses, decreases of quality of life, and chronic pain. On average, the chronic RA patient has two or more comorbid conditions. This is significant because of the comorbidities effects on quality of life, functional status, prognosis and outcome. Rheumatoid arthritis can affect nearly every part of the body. Even though the joints are most commonly affected, RA can also have effects on organs. f) Side effects from treatment and medication. Slows down the process of degeneration of the joints. Arthritis of 3 or more of the following joints: right or left PIP, MCP, Wrist, Elbow, Knee, Ankle, and MTP Joint. 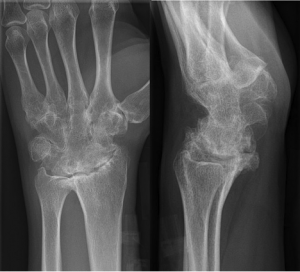 Radiographic changes including erosion or bony decalcifications localized in or adjacent to joints. (Lab Test) Blood Test Indicates inflammation. As the level of inflammation rises, so does the level of CRP. High levels of CRP over a long period of time may indicate more severe joint damage. Erythrocyte sedimentation rate, also referred to as ESR or "sed rate"
Lab Test Blood Test Indicates the presence of RA. When the immune system attacks itself, the body produces RF. 75% of people with RA are RF positive. Lab Test Blood Test This test is usually given to people who are experiencing new symptoms of RA, in order to rule out other autoimmune diseases. There is no test that can determine for sure whether someone has RA. Most patients with RA will have some abnormal test results, although for some patients, all tests will be normal. The cause of Rheumatoid Arthritis is unknown. RA occurs when the immune system attacks the synovium — the lining of the membranes that surround the joints. The resulting inflammation thickens the synovium, and can eventually invade and destroy the cartilage and bone within the joint. The tendons and ligaments that hold the joint together weaken and stretch, overtime. Gradually, the joint loses its shape and alignment. a) Smoking: A history of smoking is associated with a modest to moderate increased risk of RA onset. b) Gender: The incidence of RA is two to three times higher in women than men. c) Age: Rheumatoid arthritis can occur at any age, but it most commonly begins between the ages of 40 and 60.
d) Family History: Family history can indicate a higher risk for RA. a. Live birth history: Women who have never had a live birth have a slight to moderately increased risk of RA. b. Breastfeeding: Recent population based studies have found that RA is less common among women who breastfeed. c. Menstrual history: Women with irregular menses or a shortened menstrual history have an increased risk of RA. d. Oral contraceptives (OC): Women who had ever used OCs had a modest to moderate decrease in risk of RA. The prognosis of RA depends on the severity of symptoms and early intervention. People with rheumatoid factor, the anti-CCP antibody, or subcutaneous nodules have a more severe form of the disease. 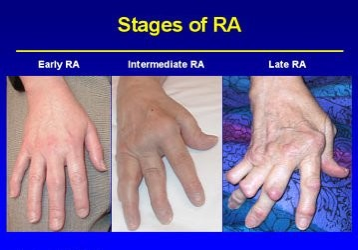 People who develop RA at younger ages also tend to progress quicker. Extra-articular Manifestations Many of the extra-articular manifestations of RA are associated with increased disease activity and with markers of inflammation, such as high levels of rheumatoid factor (RF) and C-reactive protein (CRP). The goal of medical management for RA is to prevent or control joint damage, prevent loss of function, and decrease pain. Disease-modifying antirheumatic drugs (DMARDs)- Slow the progression of rheumatoid arthritis and save the joints and other tissues from permanent damage. TNF-alpha inhibitors- Inhibit the inflammatory substance produced by the body and help reduce pain, morning stiffness, and tender or swollen joints. Surgical Treatment: If medications fail to prevent joint damage, surgical intervention may be needed to repair the joints, restore ability, decrease pain, and correct deformities. Supplements: Research suggests that there are vitamins and minerals which may have an effect on RA. These effects range from reducing joint inflammation to improving bone health. Some of the vitamins and minerals are listed below. It is recommended to consult your primary care physician before consuming any of the supplements listed below. Range of Motion/ Flexibility: Range-of-motion exercises and exercise programs can delay the loss of joint function and help keep muscles strong. Modalities: Heat, ice, massage, ultrasound, hydrotherapy, and electrical stimulation may be used to reduce pain and improve joint movement. Joint protection: Assistive devices, splints or orthotic devices to support and align joints may be very helpful. Energy Conservation: Frequent rest periods between activities, as well as 8 to 10 hours of sleep per night, are recommended. Practice relaxation and self calming strategies: Research suggests that regularly practicing these relaxation techniques can reduce stress and lead to a reduction in pain. Rheumatoid Arthritis Disease Activity Index (RADAI-5): A self-reported outcome measure that consists of 5 questions in a Likert scale format that briefly surveys the patient regarding their views of their condition (both over the past 6 months and current status). Disabilities of the Arm, Shoulder and Hand (DASH): The DASH is a patient-reported outcome measure that evaluates function of the upper extremities, and can be used to examine change over time. Short Form-36 (SF36): A patient reported outcome measure that is designed to evaluate quality of life through measures such as physical functioning, role limitations due to physical or emotional problems, and general mental health. Fatigue Severity Scale: A 9-item questionnaire that rates the patient’s fatigue and how it interferes with activities such as work or social life. Abstract: Patient is a 36 year old female who presents to PT with bilateral hand and unilateral L elbow pain, bilateral MCP joint swelling, morning stiffness, and increase fatigue. Patient was evaluated and referred to rheumatologist; patient returned to PT with diagnosis of rheumatoid arthritis. Treatment strategies included education on disease process and management as well as an individualized strength and conditioning program with modalities included for pain management. Along with physical therapy, patient was taking a prescription dose of Plaquenil daily in addition to a corticosteroid injection during severe flare-ups. Patient was seen 2x/week for a total of 6 weeks. At discharge, patient reported decrease in max pain from 7/10 on VAS to 3/10, and her Fatigue Severity Scale-9 score decreased from 35/63 to 20/63. Patient was given information about community resources and plans to begin yoga class 3x/week. Follow-up with patient planned at 3 and 6 months post discharge. Rheumatoid arthritis (RA) is a rare form of arthritis that differs greatly from a more widely known diagnosis of osteoarthritis (OA). Both forms lead to the degeneration of the of articular tissue in many joints of the body but go about the process differently. However, RA will be our main discussion point for this case study. Rheumatoid arthritis is typically described as a systemic autoimmune disease that leads to inflammation of various joints of the body, specifically hands, feet, and wrists. Furthermore, this disease does not only affect the articular cartilage, it can affect surrounding tendons, synovium, and various other structures around the joint. RA S&S include but are not limited to stiffness of affected joints in the morning, fatigue, weakness, joint swelling/tenderness, warm to the touch joints, loss of mobility of affected joints. 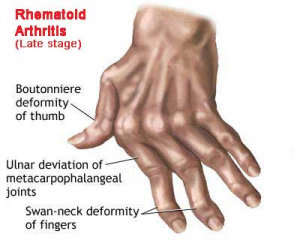 Furthermore, advanced RA can lead to deformities of the hands, wrists, and feet which can become irreversible. RA is not curable at this time but can be treated with a variety of prescription drugs, injections, and physical therapy. Presented below is a sample case study which demonstrates how a patient may present with RA. Patient presents with bilateral swelling of hands especially around her MCP joints. The joints are warm, red, and tender to the touch bilaterally. Patient has decreased ROM of MCP joints bilaterally but all other ROM of UE and LE are within normal limits. Patient demonstrated decreased grip strength bilaterally. Hand pain reported ranging from 2-7 out of 10 on Visual Analogue scale, elbow pain at 4/10 with activity. Patient scored as 35/63 on Fatigue Severity Scale-9. Patient was referred out to a rheumatologist to rule out any underlying disease that may be causing her these signs and symptoms. The patient returns to physical therapy with the diagnosis of RA. Rheumatoid factor was found to be positive along with substantial swelling of soft tissue and a loss of bone density were found on the x-ray of her hands. Patient resumes physical therapy, prescribed DMARDs from her doctor, and educated on the progression of RA and treatment options available. ● Stretching and mobility exercises: Flexor digiti superficialis and profundus tendon gliding exercises; 2x10 repetitions daily. ○ Resisted gross and pinch grip with theraputty: 2x10 repetitions, gradually increase hold time to 5 seconds. ○ Finger and thumb adduction/abduction with putty and theraband. ● Aerobic conditioning: Cycling at 60-80% of patient’s HR max, working on increasing duration then intensity. ○ Patient was also educated on use of Rating of Perceived Exertion scale and instructed to maintain a range of 12-13 (moderate to somewhat hard) for home exercise. ● Functional training: Training the patient how to perform ADL’s (activities of daily living) properly and to accommodate mobility limitations and reduce the potential for chronic pain. ● Modalities: using hot packs, cold packs, hydrotherapy, ultrasound, and electrical stimulation to reduce joint plan and inflammation. ● Co-interventions: Pt is currently taking Plaquenil (DMARD) tablets to help manage her RA, and receives a prednisone injection during flare-ups. Mrs. Smith demonstrated an improvement over several months. Mrs. Smith’s therapy involved a multidisciplinary team approach to empower her to understand and treat her RA. The Fatigue Severity Scale-9 was completed at discharge and equalled 20/63 which is a significant improvement from her initial evaluation (35/63). Mrs. Smith was able to return to biking around her neighborhood with little fatigue. Since she was educated on the RA and how the disease progresses, Mrs. Smith is able to stay tune with her body by understanding her limitations and not overdoing any physical activity. Mrs. Smith knows some of her signs and symptoms of a flare up and addresses it appropriately. She continues to utilize modalities at home such as heat and ice to reduce her pain and inflammation when needed. She has also been educated on her current medications, she has been taught what they do, why they are important to take regularly, some of the potential side effects of the medications, and when she should contact her doctor if she thinks an adverse event is taking place. Mrs. Smith has been educated on community support groups that could potentially provide some assistance in the following years. Mrs. Smith has been given and shown many exercises that will improve/sustain her mobility in her hand and reduce pain and inflammation. Now that Mrs. Smith has been educated on RA and given the tools to manage her RA on her own. She was discharged but periodical follow ups were recommended at 3 and 6 months post discharge. RA currently has no cure, which means Mrs. Smith needs to constantly manage and be aware of her disease at all times. She will more than likely have this disease for the majority of her life so therefore making sure that she has the appropriate tools and education to combat this disease on her own is crucial to remain active and promote the highest quality of life possible. 2. Goodman CC, Snyder TEK. Differential diagnosis for physical therapists screening for referral. St. Louis, MO: Saunders Elsevier; 2013. ↑ 2.0 2.1 2.2 2.3 2.4 Arthritis Foundation. Disease fact sheet: http://www.arthritis.org/conditions-treatments/disease-center/rheumatoid-arthritis/ (accessed 25 February 2013). ↑ 3.0 3.1 3.2 CDC. Rheumatoid Arthritis.http://www.cdc.gov/arthritis/basics/rheumatoid.htm (accessed 13 February 2013). ↑ 5.0 5.1 5.2 5.3 5.4 5.5 O’Sullivan and Schmitz. Physical Rehabilitation. 5th edition. Philadelphia, PA: F.A. Davis Company. 2007. ↑ 6.0 6.1 Pubmed. Comorbidities in rheumatoid arthritis. http://www.ncbi.nlm.nih.gov/pubmed/17870034 (accessed 12 February 2013). ↑ 7.0 7.1 Gabriel SE. Cardiovascular morbidity and mortality in rheumatoid arthritis. Am J Med. 2008 Oct;121(10 Suppl 1):S9-14. ↑ 9.0 9.1 eMedicine. Disease fact sheet: rheumatoid arthritis. http://emedicine.medscape.com/article/409980-overview (accessed 10 March 2013). ↑ 10.0 10.1 Firestein GS. . Etiology and pathogenesis of rheumatoid arthritis. In: Harris ED, Budd RC, Genovese MC, Firestein GS, Sargent JS, Sledge CB, eds. Kelley's Textbook of Rheumatology. 7th ed. Philadelphia, Pa: Saunders Elsevier; 2005:chap 65. ↑ Goodman C, Fuller K. Pathology: Implications for the Physical Therapist. 3rd ed. . St. Louis, MO: Saunders, an imprint of Elsevier Inc, 2009.